The interest in the application of GLONASS technologies has been expressed by Indian companies providing transport equipment, municipal transportation services, working on improving the strength and resources of police forces, and special solutions for school buses. GLONASS is looking at production sites for possible realisation of joint projects in India, Alexander Bondarenko,head of international projects for Non-commercial Partnership for Development and Use of Navigation Technologies (GLONASS Union), told RIA Novosti. Earlier, in October, a GLONASS representative told RIA Novosti that the Indian authorities would soon announce the selection of GLONASS as a partner in the application of navigation technologies in India. In early February, Russia and India held talks on the subject of navigation and information services, during which Indian state corporations expressed interest in the Russian GLONASS satellite navigation system. “We are now studying possible production sites, and have already settled on four or five options,” said Bondarenko. He added that the interest in the application of GLONASS technologies has been expressed by Indian companies providing transport equipment, municipal transportation services, working on improving the strength and resources of police forces, and special solutions for school buses. In addition, there was also an interest in the possibility of using these technologies in the petroleum and coal industries. 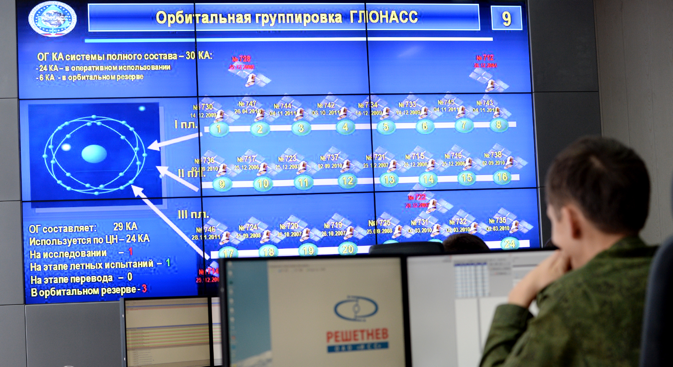 NP GLONASS is the Russian federal network operator working in the navigation field. United under its umbrella are telecommunications, information and navigation markets in Russia and the leading integrators: Yandex LLC, MTS OJSC, VimpelCom OJSC, MegaFon OJSC, Rostelecom OJSC, the GLONASS/GNSS-Forum Association, Summa Telecom OJSC, Navigation and Information Systems OJSC, Tranzas GC, Tsesar Satellit GC, Sistemy Uprvlanya OJSC, and the Federal State Unitary Enterprise ZaschitaInfoTrans. On December 30, 2013, the Ministry of Transport of the Russian Federation signed an agreement with the federal network operator NP GLONASS on the implementation of the ERA-GLONASS System starting in 2014.